Water is a big deal. Even the few climate change deniers left can’t deny droughts are becoming more common. 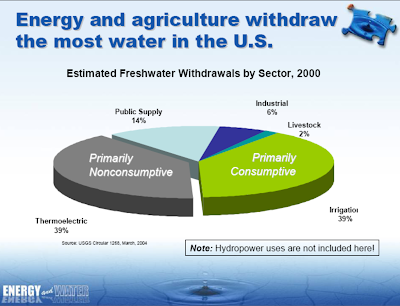 40% of the daily water used in the U.S. is for energy. It only makes sense to build the kind of energy infrastructure that least impacts water supply. When cities use water to generate power, the water table drops. Eventually, the water table comes back up as the water is recycled. But it is possible for severe shortages and serious consequences to occur in the process. Jaques Cousteau: "…sometimes we forget that the water cycle and the life cycle are the same." In The Water Cooler; The intertwined tale of energy and water, a new study from Virginia Tech researchers Rachelle Hill and Tamim Younos, hydropower, which requires lots of water but doesn’t consume any and doesn’t take any out of the cycle at all, is rated much more highly (only 20 gallons/million BTUs) than nuclear power, which uses the most water of any power generation process (2,400 gallons/million BTUs). 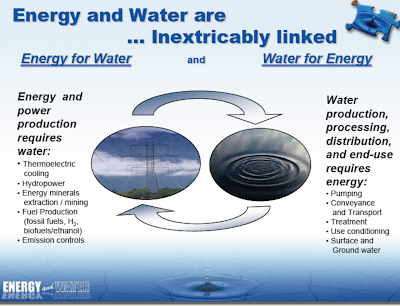 Wind energy’s water consumption is so negligible it wasn’t even considered. A nuclear energy industry spokesman was quick to point out that, overall, energy production uses 3% of water consumed while agriculture uses 81%. Tony Pietrangelo, vice president of regulatory affairs, Nuclear Energy Institute: "In the overall scheme of things, 3 percent is a small fraction…But, from the carbon standpoint, CO2 emissions (from power generation) can be a major contributor to greenhouse gas levels." The study focuses on water but includes observations about greenhouse gas (GhG) emissions, pointing out that both must be considered in choosing what energy infrastructure to build. 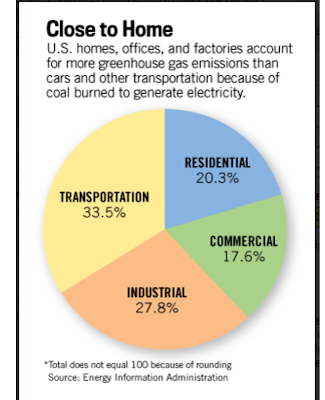 From the GhG standpoint, nuclear is probably better than coal. But – all things considered – a solar power plant (230 gallons/million BTUs) is a vastly superior choice than a coal-fired power plant (1,100 gallons/million BTUs) or a nuclear plant ( say it again! – 2,400 gallons/million BTUs). Tamim Younos, Virginia Tech research professor/ study co-author: "Ten to 15 years down the road, if we keep doing what we're doing (with water and energy), it will not be sustainable…"
In keeping with the rising tide of evidence against the value of biofuels for transportation, ethanol and biodiesel are much worse than any fossil fuel in terms of water consumption though biodiesel might warrant consideration in light of its possibly favorable GhG emissions. Ethanol gets an especially bad rap because the water used to grow crops may be contaminated by fertilizers and do special harm to the water supply. 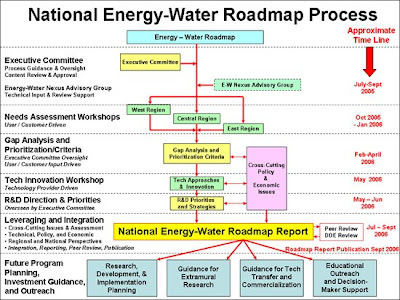 More information is available from the Energy-Water Nexus, a study from a consortium of U.S. Dept. of Energy labs, from which the illustrations below were borrowed. The Water Cooler; The intertwined tale of energy and water rates major sources of energy production and power generation according to their water use and consumption. Presently, droughts appear to be sporadic phenomena. 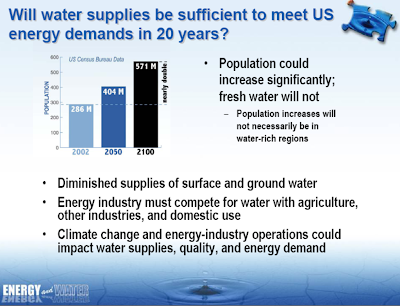 If predictions about global climate change are accurate, drought will be an ongoing problem and having an energy infrastructure with lower water requirements in place will be a great advantage. The U.S. Southeast, Australia and the Amazon region of South America are all currently struggling with drought. - U.S. thermoelectric power plants consume 136 billion gallons of water per day, averaging out to 25 gallons for every kilowatt-hour produced. Uses: cooling and cleaning of machinery, steam to turn turbines. - Rachelle Hill, co-author: "We need to do more research and really study what goes into energy production, not just what comes out…"
- Eric Evenson, U.S. Geological Survey: "Any one factor, like water needs for energy, or for public supply, or for agriculture … bears on the quantity of overall water availability…"
- Mike Hightower, Energy-Water Nexus National Lab Team: "In the United States on a daily basis, about 40 percent of our fresh water withdrawals are for energy production…Even if you don't consume a lot of water, if you use it, you need it day in and day out to operate…[If a drought occurs] then water levels lower, you can't withdraw any more and that's going to impact your energy supply." - Kerry McCalman, power manager, Bureau of Reclamation/U.S. Department of Interior: "Hydropower generated by the Bureau of Reclamation as a whole offsets 31 million tons of CO2 emissions per year, on average…"
- Tony Pietrangelo, vice president of regulatory affairs, Nuclear Energy Institute: "Power production is not a significant consumer of water, especially compared to agriculture…"
OFFSHORE WIND - GREAT FOR THE GREAT LAKES? Offshore wind installations are a reality in Europe and will sooner or later be a reality in the U.S. The Great Lakes region has really wonderful energy resources and somebody is going to get really rich by taking on the challenges and winning through. The challenges, though, are daunting. Other U.S. offshore projects have been stymied by environmental resistance, aesthetic objections, enormously costly technical obstacles and the building of undersea transmission. Many of the same challenges are beginning to stop Wisconsin onshore wind installations. 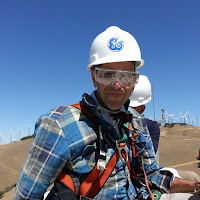 Considering the opposition and the difficulty, it might be hard to understand why wind developers persist - until the thought of global climate change makes the difficulty of building wind seem worth the effort. Sooner or later aesthetic objections to wind installations will succumb to the much more ominous objections of global climate change and the ugly devastations of coal mining. Sooner or later the environmental impact of wind installations will be understood as trivial in comparison to that of global climate change and the horrors of a potential nuclear accident. Sooner or later the readiness of wind installations will emerge as superior to the dangers and difficulties of building LNG terminals. Sooner or later the offshore wind technology being proven right now in Europe will be put to work in the U.S. while scientists continue to try to figure out how to make “clean” coal something more than an oxymoron, while scientists are still trying to get up to speed on the hydrogen highway, while politicians continue to fight about nuclear waste storage. Sooner or later. Most likely sooner. 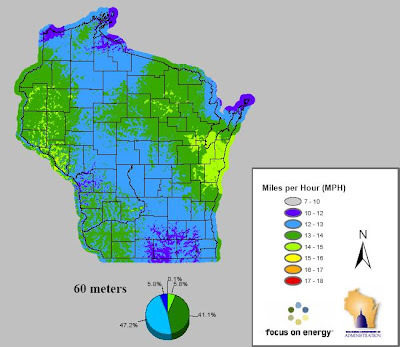 Three offshore wind projects are under consideration for Wisconsin’s Lake Michigan and Lake Superior coasts but not making rapid progress. All projects in preliminary stages with funding unclear. 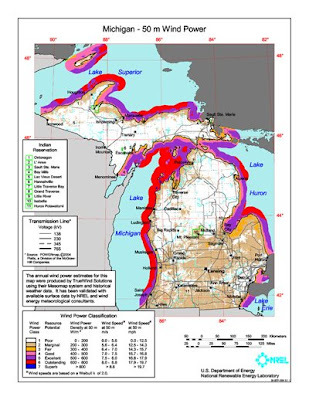 - Development of offshore wind installations is being proposed for Lake Michigan and Lake Superior. 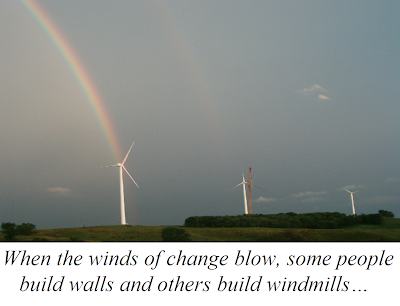 - Onshore wind is a booming business in Wisconsin, across the U.S. and around the world. - Germany, Ireland and Denmark have offshore installations and many more are planned or under construction in Europe. - U.S. projects off Cape Cod, Long Island and Galveston, Texas, are mired in controversy. - Cost estimated to be millions of dollars and projects must win citizen approval. - Radial Wind has been stopped for lack of technology to deal with the Mid-Lake Plateau’s 200-foot depths Illinois energy engineer and real estate developer William Goldstein proposes to build in. 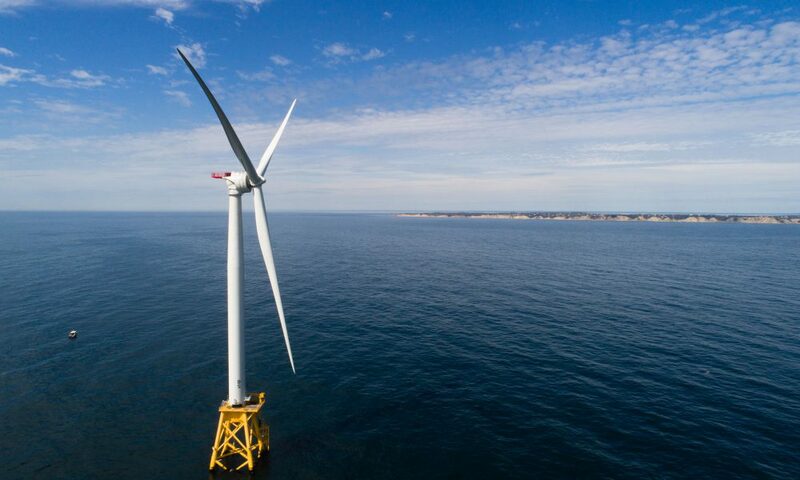 - Wisconsin’s DNR is considering Ewindfarm Inc. of California’s proposed 610 turbine project 1 to 2 miles off a stretch between Kewaunee and Kenosha. - An unidentified developer has proposed a ~200 turbine installation off the east-central Wisconsin coastline. Dan Ebert, chairman, Wisconsin Public Service Commission: "We need to look at what are the economics of that, how feasible is it, what are the environmental issues that are involved. To understand those issues and examine it as an option is something we clearly should do…"
Efficiently converting sunlight into energy is the dream. Plants do it at nearly 100% efficiency. Humans have figured out how to do it at anywhere from 10% to 40% (or so) efficiency (depending on how much you want to spend). Maybe it’s because plants don’t waste their efforts on American Idol or Britney Spears. 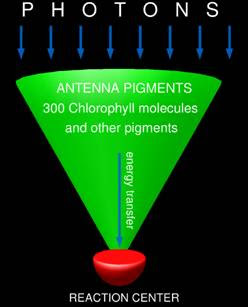 No, no – plants use a network of pigment-protein complexes. Scientists want to know more about how those networks work. 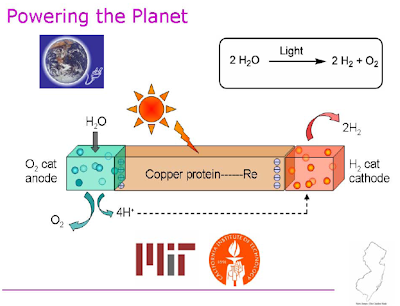 Maybe the most amazing part of plant photosynthesis is that it consumes carbon dioxide, the biggest if not the baddest of the greenhouse gas (GhG) emissions, and produces oxygen, the stuff humans need to breathe. For obvious reasons, most of the brilliant scientists doing deep research in the area of solar energy are trying to replicate the process. It has been slow going. A new breakthrough will allow them to see the process a little more clearly. For those seeking a technical understanding of the breakthrough, quotes from the researchers are below. Even more informative is Inorganic Mimics of Photosynthesis, Professor Harry Gray’s November 9, 2007, CalTech lecture, from which some of the illustrations below are borrowed. “Visualization of Excitonic Structure in the Fenna-Matthews-Olson Photosynthetic Complex by Polarization-Dependent Two-Dimensional Electronic Spectroscopy” moves researchers a step closer to understanding why plants can do what human technology has so far failed to do – turn light into energy efficiently. 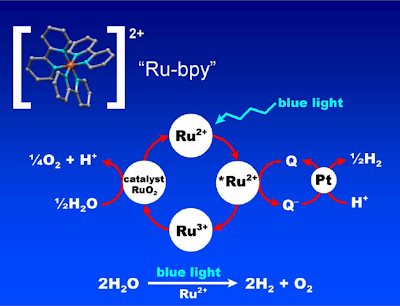 2.5 to 3.5 billion years ago: Converting light into energy allowed plants to evolve. The byproduct, oxygen, allowed animal life to arise. 1839: French Physicist Alexandre Edmond Becquerel first observed the photoelectric effect. 1883: Charles Fritts made the first solar cell. 1901: Nikola Tesla on the case. 1904: Einstein’s paper on the photoelectric effect. 1916: Robert Millikan proves the photoelectric effect. 1950s: Bell Labs make solar cells for space satellites. 1954: Bell Labs makes first silicon solar cell. Early work was with selenium, germanium and dyes. 1955: Western Electric licenses the first commercial solar cell. 2% efficiency. $1,785/watt. Lot’s more detail at the full-length version of Wikipedia’s Timeline. - Fleming and his group have used a laser-based technique (two-dimensional electronic spectroscopy) to track the flow of energy. 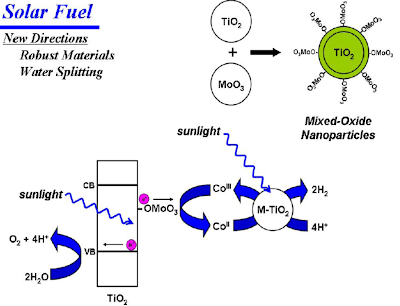 For the first time, they’ve connected that flow to energy-transferring processes in pigment-protein complexes. - One of the researchers describes the breakthrough as improving “reception” of the images already being made. - Three laser beams in femtosecond bursts are amplified and phase-matched by a fourth (oscillator) beam. - In photosynthesis: Frenkel excitons (named after Russian physicist Yakov Frenkel) are released when light excites plant pigments to release chemical energy. The excitons carry energy down specific pathways in the plant to produce its activity and leave it in a new state (nourished, releasing oxygen, etc.). The new imaging breakthrough allows better visualization of this process. Think of the Renewable Electricity Standard (RES) as a doctor’s prescription. The state is suffering economically from the decay of its manufacturing base and it is heavily dependent on fossil fuels for energy. The RES is the Rx the state needs to get well. It prescribes a little more New Energy every year for the foreseeable future. The state’s system slowly, surely, responds. It builds an increasing capacity for producing clean New Energy, growing economically until it no longer suffers from dirty energy and economic woes. Ohio is about to become the 25th of the forward thinking states with an RES. A study last year found that a boost in wind energy production of which Ohio is fully capable would generate investment of $8.2 billion and create 3,100 jobs in the state. 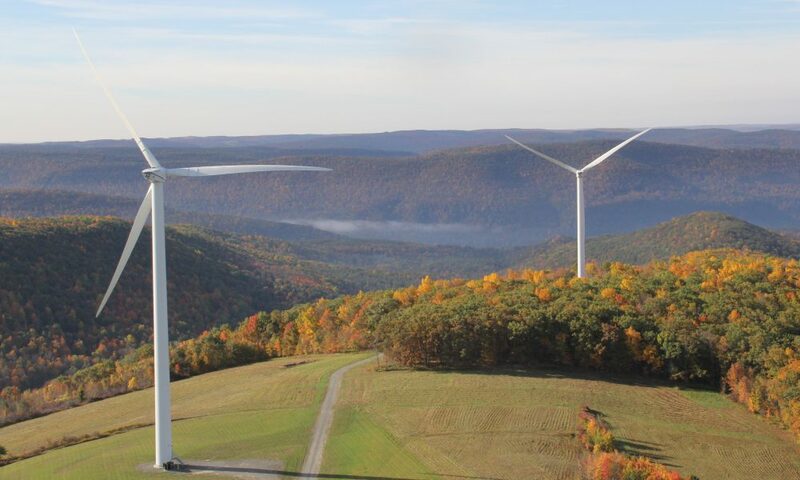 The American Wind Energy Association (AWEA) estimates Ohio’s new RES may actually generate $12 billion in investments! One of the first signs of returning health in Ohio will be the conversion of the rust belt infrastructure into New Energy businesses and factories producing and selling the thousands of machine parts necessary for a wind turbine. Ohio’s manufacturing potential is also expected to be the basis for enormous growth in solar panel production. Think Ohio is an unlikely place to be a solar energy hub? Germany is the world leader in solar and it has the solar energy potential of Anchorage, Alaska. Ohio has already spawned First Solar, the thin film solar sector’s biggest success story. 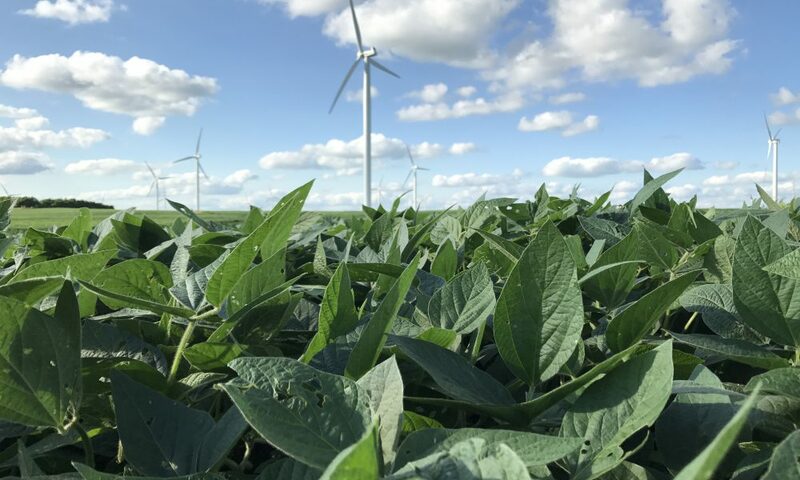 Erin Bowser, Director, Environment Ohio: "We may have more wind turbines going up, but the whole northwestern part of the state is in position to manufacture solar panels…"
Michigan’s Governor Granholm is pushing HER legislature to pass an RES. Smart. Michigan needs the same medicine. 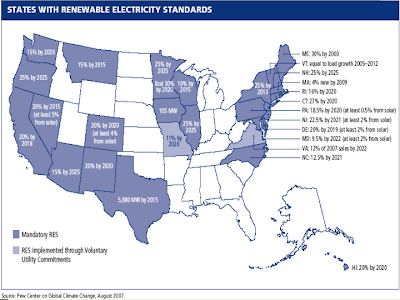 Governor Strickland has pushed through the Ohio legislature a Renewable Electricity Standard (RES) requiring the state’s utilities to get 12.5% of their power from New Energy sources by 2025. - In 2009: Ohio’s new RES requires its utilities to get 0.25% of their power from New Energy sources and to ramp up from there. - By 2020: Ohio’s wind energy industry intends to produce 20% of the state’s electricity. - Both Ohio’s legislative houses have agreed on the RES and Strickland is expected to sign momentarily. - Bowling Green: The state’s only operational wind farm, 4 turbines. Lots of room for growth. 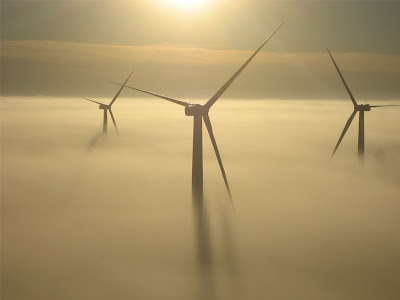 - Ohio’s northwest and Lake Erie: Best locations in the state for wind farms. 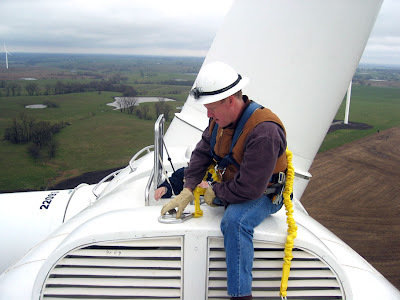 - A 2007 study by Environment Ohio: If wind power is producing 20% of the state’s electricity by 2020, it will generate investments of $8.2 billion and 3,100 jobs. - AWEA estimates the 12.5% by 2025 RES will generate $12 billion in investments. 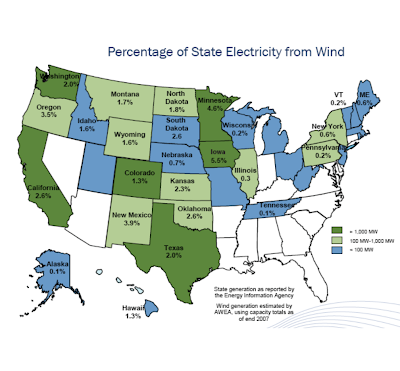 - Wind accounted for nearly a third of new U.S. electricity generating capacity in 2007 and accounted for investments of $9 billion. In ONE year! Erin Bowser, Director, Environment Ohio: "We basically looked at what would happen if we met our need for electricity with wind energy rather than stay the course…There already more than 100 companies based in Ohio that in some way, shape or form are creating (energy) jobs." 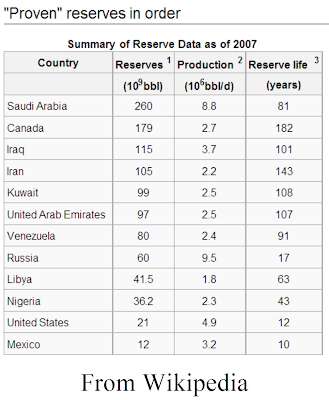 The OPEC nations like to make money. No surprise? OK, then why aren’t they pumping more oil into the system while prices are higher than a 1960s college student? 2 possibilities: (1) They can’t pump any more; Or, strange as it seems, (2) pumping more oil won’t relieve demand. 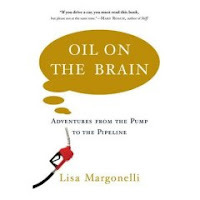 A lot of people insist the first explanation is the right one because if they could pump and sell more oil they would - because they like to make money. OPEC says it’s the second explanation. 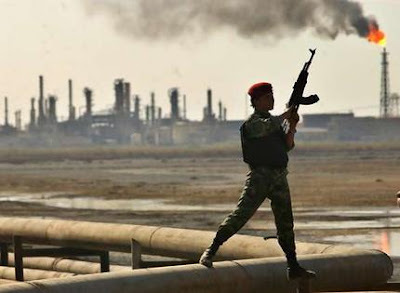 HE Abdalla Salem El-Badri, Secretary General, the Organization of the Petroleum Exporting Countries (OPEC): "Crude oil prices have become detached from the dynamics of supply and demand…"
Oil prices are so out of line they’ve become a problem even for oil producers. Nobuo Tanaka, Executive Director, International Energy Agency (IEA): "[Prices are] too high for everybody, especially for developing countries who face other significant cost increases." There is a curious and potentially tragic pattern developing. Rising populations in developing countries are consuming larger gross quantities of oil but it is drastically smaller per capita consumption. Badri: "…energy poverty will remain an important challenge. By 2030, developing countries will consume, on average, about five times less oil per person than OECD countries…"
Meanwhile, oil traders are hustling oil, driving prices up, and neither OPEC nor the IEA can get a bead on the arcana of commodity transactions and individual company supplies that might bring more rationality to the marketplace. Tanaka: "[The] major problem…[is the] lack of stock data…Individually countries may feel their data is sensitive…but globally a lack of transparency aggravates [market] volatility." With peaking supplies, OPEC could put itself in such a powerful position. 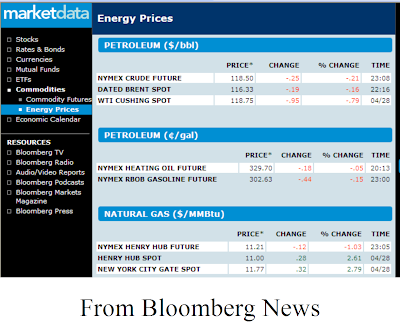 Instead, as its member states pull against one another, prices drive the market toward New Energy development. OPEC has always been its own worst enemy. It’s the only comfort for the equally impotent leaders of the developed economies. And it’s great news for New Energy. Tanaka: "In the short-to-medium term, there is an urgent need for investment to restore an adequate cushion between oil supply and demand…But for the longer-term, to meet environmental concerns, we will require a new global energy revolution to transform the way we produce and use energy." “Non-fundamental factors” – commodity market speculation, a weak dollar and geopolitical tensions – are the driving factors in rapidly rising oil prices. Meanwhile, the oil industry is not profiting or building itself. - The Tanaka and Badri observations were made at the 11th International Energy Forum in Rome, April 21. - The title of Badri’s talk: "Reflections on key oil challenges and opportunities"
- OPEC and the IEA expect oil demand to remain strong in the transportation sector. - Developing countries, where high oil prices are now creating economic stresses, are expected to be central to the future of oil demand in the coming decades. - Tanaka and Badri agree that the weak dollar means it costs more dollars for the same amount of oil. - Ironically, Tanaka described oil as an "underinvested commodity" because there is way too little of oil profits being spent on exploration & production and on industry infrastructure to sustain the oil economy. - Badri: "OPEC has played a vital role in keeping the market well-supplied during the recent volatile period, with our Member Countries increasing crude output, as needed, and accelerating capacity-expansion plans…There are, for example, more than 120 upstream development projects, and cumulative investment in new capacity exceeds US $150 billion." - Badri, on oil demand and poverty: "Most of the new demand will come from developing countries, with consumption doubling to 58 mb/d, and Asia will account for more than half this increase…"
- Tanaka: "Oil prices are higher in all currencies…"
The American Solar Energy Society's SOLAR 2008 (San Diego, May 3-8) is not just another beach party. 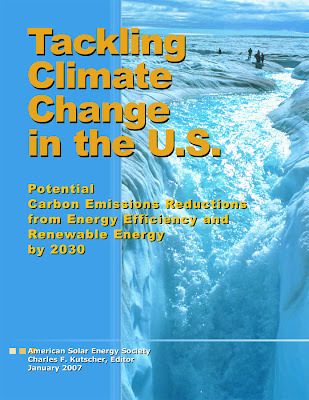 ASES has been advocating on behalf of solar energy since 1954. This is their 37th annual get together. 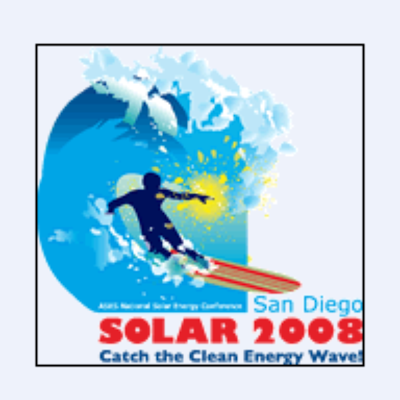 ASES will no doubt put on an exciting and entertaining event but this organization goes back to solar energy's early days and its focus is as much scientific as it is informational or professional. Scheduled speakers range from former presidential candidate and U.S. Senator Gary Hart to film director Chris Paine (Who Killed The Electric Car?) to Julia Blunden of industry giant SunPower Corp. This is an event everybody from industry insiders to citizens concerned with global climate change to alternative transportation mavens will not willingly miss. And NewEnergyNews will be there. Come by and say "Hey!" SOLAR 2008, the American Solar Energy Society annual conclave covering everything important in the world of solar energy. - ASES was founded in 1954. ASES headquarters is Boulder, CO.
- Renewable Energy Technology Solutions: …An overview of the current state of the industry, and visions for where the industry will be in 20 years. 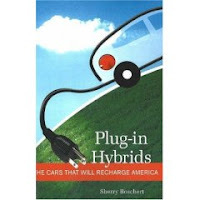 - Emerging Transportation: The documentary Who killed the electric car? has mainstreamed interest in electric vehicles and has brought attention to the auto industry’s role in delaying the availability of clean renewably powered vehicles. Chris Paine, director of the film, and Chelsea Sexton, one of the main characters in the documentary will speak on their continuing efforts to promote vehicles that can be charged from renewable energy. Steve Heckeroth, Chair, Renewable Fuels and Sustainable Transportation Division will wrap up the plenary with a presentation the many advantages of solar electric mobility. 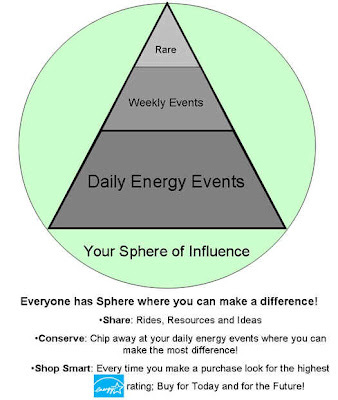 After studying the subject of efficiency, U.S. News & World Report energy writer Marianne Lavelle came to the conclusion that efficiency remains a vital and unappreciated fraction in the New Energy equation. More disturbingly, it is the same vital and unappreciated fraction it has been for more than three decades. As Carl Pope pointed out at a recent Sierra Club panel discussion, the U.S. spends billions subsidizing poor people’s heating fuel bills but if the same subsidies were used just ONCE to retrofit those folks' homes it could stop paying for unnecessarily burning fuel over and over. Perhaps the most disturbing reason efficiency measures don't get implemented came from a Berkeley professor who suggested people just don’t take to change. In conjunction with U.S. News & World Report stories on efficiency measures for homes and businesses, LaVelle offers thoughts on efficiency – simply reducing consumption of electricity and other fuels – a crucial but overlooked component of the New Energy strategy. 1978 through 2008: Energy efficiency R&D was 15% of total Energy R&D while nuclear R&D was 41%, fossil fuels R&D was 25% and New Energy was 16%. Lavelle mentions work done on energy and efficiency at Oak Ridge National Laboratory and at Lawrence Berkeley National Laboratory. - Putting Your Home on an Energy Diet; Simple steps with fast payback can cut family power bills describes managing appliances and structural improvements in the home. - Three Ways Businesses Can Save on Power; Factories and offices often waste energy needlessly describes ways to use wasted heat to generate electricity, new multi-speed motors to run pumps, fans and processors and developing landlord-tenant relationships to retrofit inefficient buildings in affordable ways. - A Lawrence Berkeley National Laboratory efficiency website supports developing best practices. - Examples of home efficiencies: Ductwork construction inside the house “envelope” (instead of the attic or crawl space) cuts heating and air conditioning costs 25% to 33%. Lee Schipper, energy efficiency scientist/visiting scholar on transportation sector issues, University of California-Berkeley: "…We've been doing these scenarios and potentials for 35 years. The question is why are we still doing it? There is a fundamentally deep and disturbing opposition to the notion that things can change…"
INSTALL SOLAR PANELS & BE A POWER PRODUCER? Chris Bellizzi ran his air conditioning more than he normally would, more than he needed to, in Summer 2007. Why? Because he didn’t want utility PG&E to profit from the free electricity his home solar installation was sending it. Bellizi: "If you owe them, you've got to send them a check...If they owe you, they'll pocket it." 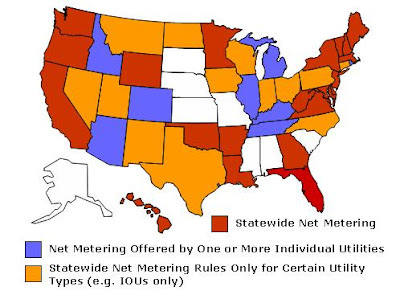 California’s Assembly is considering a change to its “net metering” law, AB1920, that would change Bellizzi’s situation, the first such U.S. provision to do so. It would allow home power producers to do more than just wind their electricity bills to zero, as most net metering provisions allow. 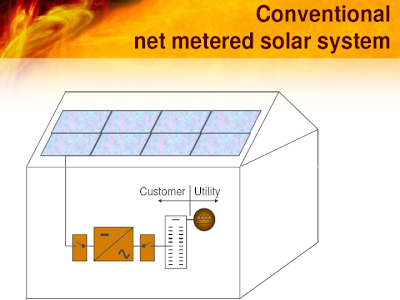 It would require the utilities to pay for excess electricity home systems send to the grid. Sounds only fair, right? PG&E, one of California’s biggest utilities and biggest boosters of solar energy, opposes AB1920. So does The Utility Reform Network (TURN), an important ratepayer advocate. Why? For interesting reasons that reveal how hard it is to make good legislation and how hard it is to create good incentives. PG&E contends that the payments from the utilities to system owners like Bellizzi would come out of the pockets of their other ratepayers. Since solar system owners are usually more affluent than non-owners, it would constitute a sort of unfair subsidy by those who can’t afford solar for those who can. PG&E also objects to AB1920 letting city-owned utilities off the hook on this. TURN points out that California already subsidizes home solar energy installations through its Million Solar Roofs program (aka California Solar Initiative, aka SB1). 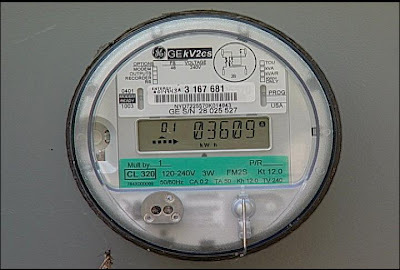 Because of that measure, solar system owners are being “paid” at a premium rate (25 to 30 cents/kilowatt-hour) for their power instead of the normal (9 to 10 cents/kilowatt-hour) rate - until their meters wind back to zero. Opponents of the measure suggest that if system owners want to even the rules, the state ought to even the rates as well. Marcel Hawiger, TURN staff attorney: "Homeowners who generate excess electricity should be paid fairly for that electricity, but shouldn't be subsidized a third time by the rest of the ratepayers, who already fund generous subsidies for rooftop solar…"
Assembly Jared Huffmann (D-San Rafael), the AB 1920 author, and Environment California think differently. Dan Jacobson, legislative director, Environment California: "We should take away any disincentives there are…We don't expect this to be a huge moneymaker…This will only help to pencil out solar a little faster." Seems like Huffman might need to head back to the legislation drawing board to iron out some of the complications. He might need to keep his calculator handy. AB 1920, a bill before the California Assembly that would increase payments to solar system owners from utilities. - AB1920, introduced by Huffmann, is presently working its way through the legislative process. - AB 1969 was enacted in 2007 to allow solar system owners to choose from categories for reimbursement. - California would be the first state to require payment to home solar system owners. - Michigan, Minnesota, Rhode Island and other states are considering such measures. - The California Solar Initiative and other existing laws, the size of a solar system is limited to proportions consistent with the building it is built for, preventing the likelihood of significant electricity overproduction. - Current provisions allow solar and wind system owners to wind their bills all the way back to zero but not to become “power producers” by earning money from their systems. 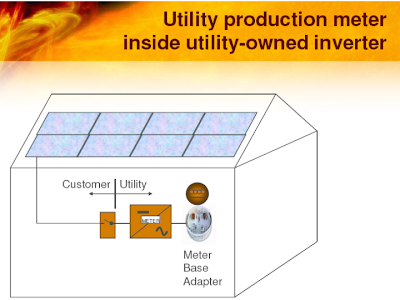 - Only 7% of California PG&E solar system owners generate excess kilowatt-hours. - PG&E objects to money going from its non-solar system owners to its solar system owners and it objects to having city-owned utilities excluded from the same rules it would have to follow and the same expenses it would have to bear. Assembly Jared Huffmann (D-San Rafael): "If they generate surplus power beyond their own energy needs, that's a gift to the utility…There's no compensation…This bill for many people will improve the economics…"
NewEnergyNews pop quiz -> What drives a powerful utility heavily invested in fossil fuels and a huge oil company to get into wind? Dominion and BP Alternative Energy are splitting costs and benefits of wind installations in Virginia and North Carolina because the wind is there and both states have RESs. 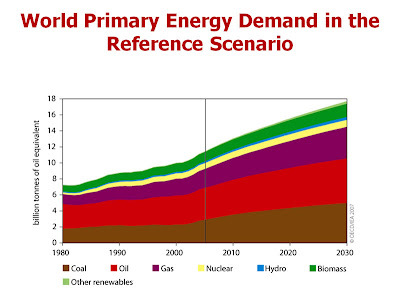 The companies can therefore know 3 things: (1) It goes almost without saying that energy demand will inevitably rise; (2) The demand for New Energy is guaranteed by the RESs; (3) The natural resource (wind) is available. Given those circumstances, even Big Utilities and Big Oil can see the business sense in making a move to New Energy. It's becoming more inevitable every day. The companies will jointly develop wind energy projects. 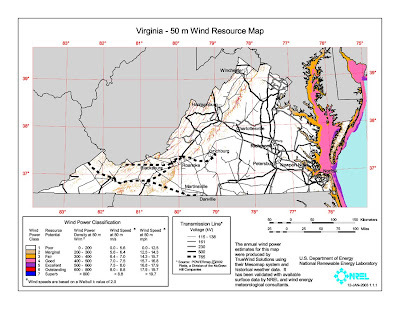 - Virginia’s RES requires 12% of its power to come from New Energy by 2022. 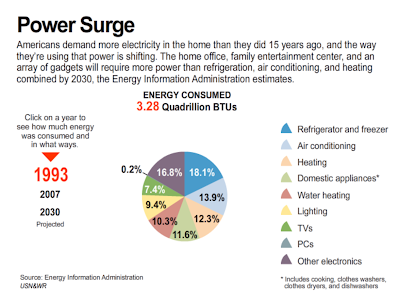 - North Carolina’s RES requires 12.5% of its power to come from New Energy by 2021. - BP and Dominion have already partnered on the in-construction Fowler Ridge Wind Farm in Benton County, Indiana. - The new agreement is on the building of wind installations in Virginia to serve Dominion customers in Virginia and North Carolina. - Dominion and BP are 50% partners on 650 megawatts of the 750 megawatt Fowler Ridge installation. BP will retain sole ownership of 100 megawatts. The project’s first phase is expected to go online by the end of 2008. - Dominion has a portfolio of ~26,500 megawatts of generation, including natural gas and oil reserves and supply, natural gas systems and storage system and serves retail energy customers in 11 states. It has ~1,300 megawatts of New Energy, including 750 megawatts of wind in Indiana, West Virginia and Illinois. 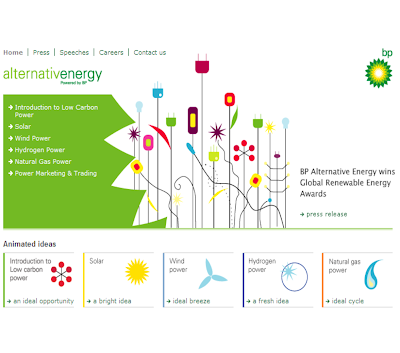 - BP Alternative Energy is involved in wind, solar, hydrogen power with carbon capture and storage, natural gas-fired power generation, biofuels for low carbon transport and distributed energy for emerging markets. 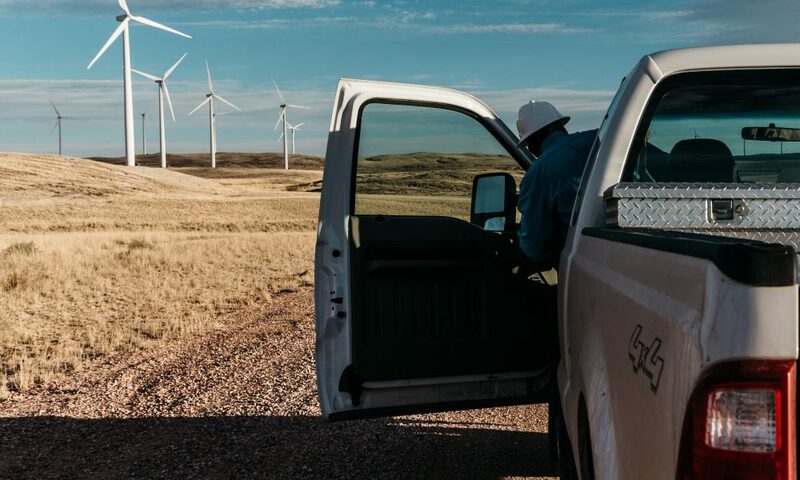 It is one of the biggest wind developers in the U.S. (~100 projects, ~15,000 megawatts), has 5 new projects under construction (in California, Indiana, Kansas and Texas) and will have 1,000+ megawatts of wind in operation by the end of 2008. BP America is the largest producer of oil and gas in the U.S.
- Thomas F. Farrell II, chairman/president/chief executive officer, Dominion: "Today's announcement is another important step in continuing to grow Dominion's portfolio of renewable energy projects -- which include more than 750 megawatts of wind in operation or under development -- to help provide for our customers' growing electricity needs. We are committed to meeting Virginia's…[and] North Carolina's goal[s] of…renewable energy sources…We look forward to our continued partnership with BP…"
- Bob Malone, chairman/president, BP Alternative Energy North America Inc.: "BP is rapidly growing its wind power portfolio in the U.S. and we are happy to be working again with Dominion…Wind is one of America's most abundant natural resources and we believe that turning wind into electricity should be a major part of the nation's drive to increase the use of alternative energy and reduce carbon emissions. Through investments like these…and through continued investment in our core oil and gas business, we are working to diversify and expand U.S. energy supply." For the third week in a row, NewEnergyNews leads “Sunday World” with a story about a U.S. New Energy producer gearing up to produce overseas. China is going to incentivize solar installations. The U.S. Congress doesn’t seem inclined to. China is unimaginably energy hungry. China is a factor in coal, driving the argument about “clean” coal technology because China builds a new coal plant or two every week. China is a factor in oil, threatening to bring the world to the oil Peak almost on its own with its exponentially expanding car buying and highway building. China is a factor in nuclear, driving the development of next-generation “closed cycle” technology. And China is serious about solar, so serious it is thinking about much more than solar rooftop installations and solar power plants. The new Weihai solar city (see BP SOLAR AND AUSSIES WILL HELP CHINA BUILD SOLAR) is exciting, but where China wants solar is in rural areas where the grid does not go. 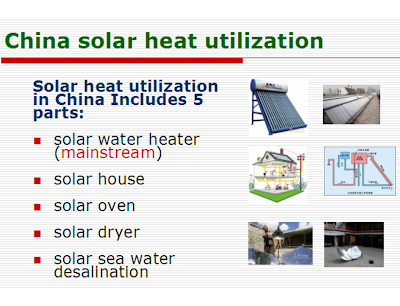 China Solar & Clean Energy Solutions, Inc. (CSOL), a Connecticut company, designs, manufactures and distributes solar hot water heaters, coal-fired space heating systems (boilers, furnaces and stoves), and biomass (waste heat recovery) products. That is the combination of power rural Chinese depend on - if they have power - in their homes, working places and public places. 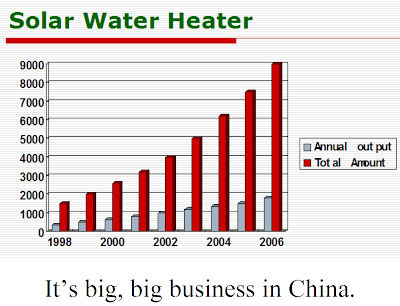 Around 60% of China is rural and only 1 in 10 rural households has a water heater. 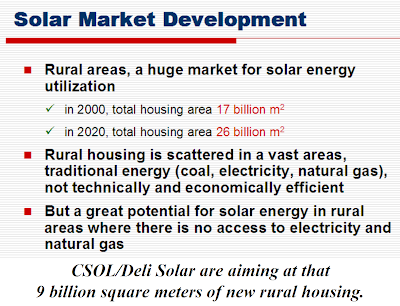 CSOL calls that a $2.7 billion market opportunity. Fourth-quarter 2007 revenues jumped 119% to $12 million. Quarterly net income skyrocketed 479% to $1.1 million. 2007 full-year revenue was up 73% to $37.1 million and 2007 net income was up 104% to $2.53 million. CSOL closed at $1.92/share April 16. It traded between $1.50 and $4.50 over the last year. Based on 2008 Standard & Poor 500 earnings estimates, its P/E is about 14. One caveat”: CSOL’s CFO resigned without warning in January. Yihai Yang was appointed acting CFO March 24. Check on China: China Solar & Clean Energy Solutions, Inc.
CSOL looks to own a huge part of a huge market with a lot of upside potential. - January 2008: CSOL bought Shenzhen PengSangPu Solar Industrial Products Corp.
- April 11, 2008: CSOL reported record fourth-quarter and full-year 2007 revenues. - CSOL is based in Connecticut. - Deli Solar’s Tianjin Huaneng specializes in products for China and Southeast Asia. - CSOL’s Shenzhen PengSangPu Solar specializes in the southern China market. - CSOL was formerly named Beijing Deli Solar Technology Development Co., Ltd.
- CSOL revenues: 45% -- solar hot water heaters; 30% -- biomass; 25% -- coal space heaters. - Solar hot water heaters are 75% cheaper to run than gas or electric heaters, last 20% to 30% longer and are 3 times as efficient as electronic, twice as efficient as gas. - CSOL has a portfolio of 80 products. 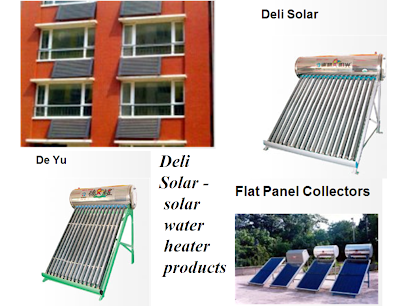 - Deli Solar’s Tianjin Huaneng makes solar water heaters, heat pipes and tubes, heat exchangers, blast stoves, heating filters, water boilers, and radiators. - CSOL’s Shenzhen PengSangPu Solar makes solar hot water heaters and space heating devices. Paul J. Resnik, analyst, Dutton Associates: "strong speculative buy"
The IDB will stop spreading its wealth to Latin American food crop ethanol producers in favor of those who cultivate hardy nonfood crops like Jatropha on non-arable lands. Nathaniel Jackson, senior advisor, IDB: "It's a good thing that voices have been raised in that debate. Biofuels are not a complete panacea, we have to distinguish between what are the better sectors of biofuels…The ideal will be something like Jatropha which clearly has no impact on food prices…Now, if they come to us with anything that would directly impact food prices, we say that's probably not what we're looking for..."
This new IDB policy is NOT what Brazil is looking for because it loves its sugar ethanol. Brazil is a special case. 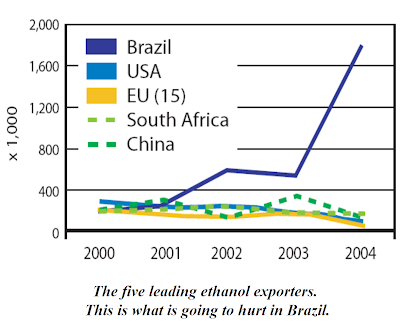 It is making sugar cane ethanol work a lot better than corn ethanol works, and in some parts of Brazil the economic value of promoting it is greater than the harm. So the IDB will be flexible on that subject. Jackson: "If there's a sugar cane project coming our way we ask 'where is it'? If it's up there in the area we want to target, which the government wants to develop, then from that standpoint it comes into the equation…"
That’s kind of like corn ethanol in the U.S. – if it’s in the Midwest where the presidential candidates need VOTES, they’ll include it in the equation. The truth is that biomass is more efficiently used for biogas to generate electricity than as a transportation fuel. Sorry. The IDB has changed its policy regarding financing for biofuels development, shifting funding away from food crops to non-edible crops that grow on non-arable lands without significant cultivation. - In keeping with a growing interest in developing non-petroleum fuels, IDB has been funding ethanol and biofuels projects. 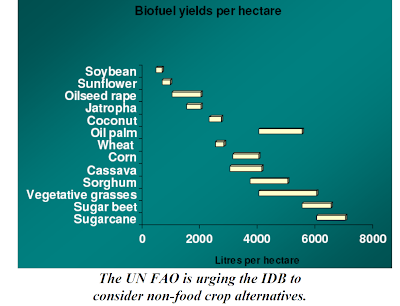 - In light of the recent UN FAO announcement and other criticisms of agrofuels, IDB will has now shifted its emphasis. - 2008: IDB will increase its funding of selected biofuels projects from 1% to 10% of its $4 billion investments. - The Latin American Renewable Energy Financing Forum, Rio de Janeiro. 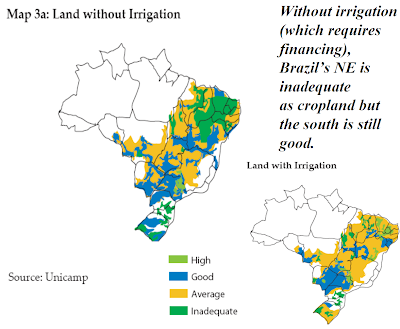 - The IDB will support sugar cane-based biofuels in the poor northeast of Brazil but not in the wealthier southeast (Brazil’s main sugar cane region). - According to the UN FAO, the world’s increased production of biofuels is making food more expensive and less available to Latin America’s poor and hungry. 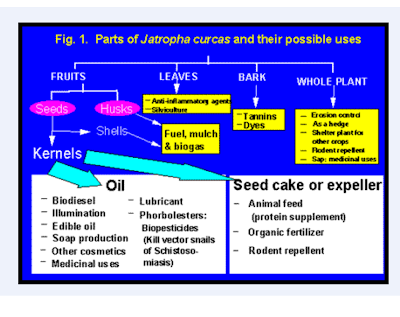 - IDB likes Jatropha, an extremely hardy non food crop that grows in arid regions all over the world. It is being successfully cultivated for biofuel in India and Africa. - IDB will not invest in corn ethanol production. - IDB is also not big on soy as an ethanol source. It might go for sorghum. It will go for sugar cane if production serves the population more than it harms food production. Nathaniel Jackson, senior advisor, IDB: "We think sorghum would be appropriate, but for instance soy would not be ideal, as it impacts (food) prices. We do reckon sugar price does have an impact. It is by and large less desirable than jatropha, but then again, we have to look at the overall development picture…"
An important preliminary meeting in Paris of 16 major world economic powers responsible for 80% of world greenhouse gas (GhG) emissions to set goals and pick methods for the fight against global climate change ended April 18 with little of importance accomplished. 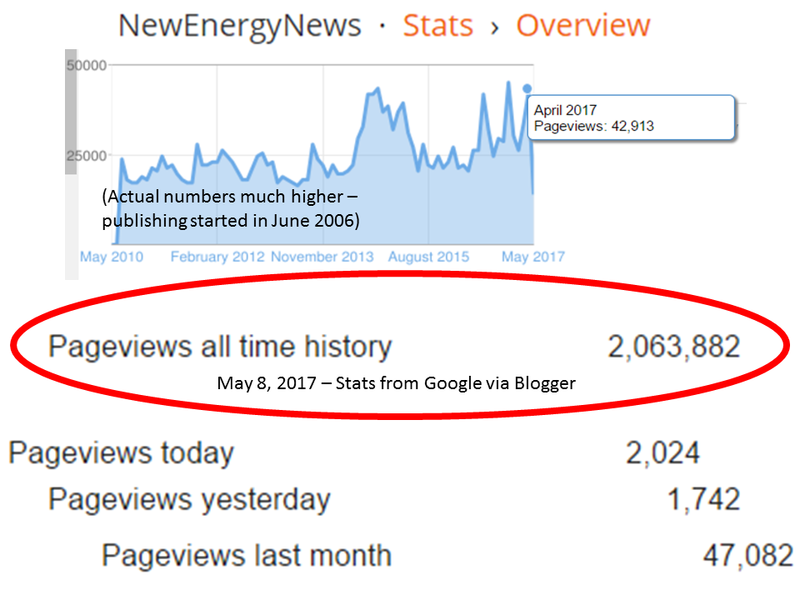 NewEnergyNews readers might wonder why, considering how much of importance COULD be accomplished. Well, it started the night before the get-together. 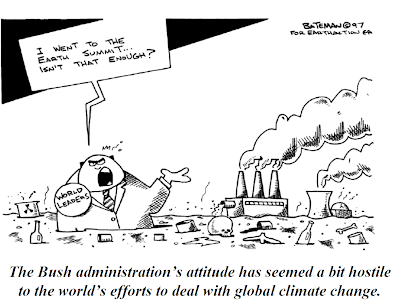 President Bush announced his administration’s 2 “breakthrough” goals to confront global climate change: (1) No mandatory caps on emissions, only incentives to reduce; (2) The U.S. will aim to stop increasing GhG emissions by 2025. 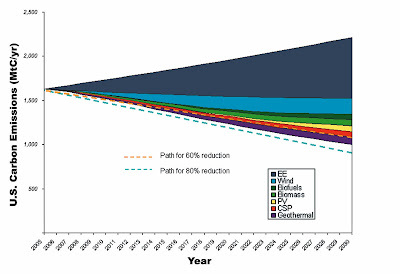 For comparison: The pending EU goal is, beyond hard caps, 20% emissions reductions from 1990 levels by 2020. California’s goal is, beyond hard caps, 20% reductions from 2005 levels by 2020. The meeting convened. A concrete timetable for emissions reductions and specific caps were discussed. There was no agreement. Developing countries would not agree to anything without specific pledges from the U.S. and the U.S. wasn’t pledging to anything but incentives on caps or anything sooner than 2025 for cuts. The meeting adjourned. Jean-Pierre Jouyet, secretary of state for European affairs, France: "As a European, we would like to see the most quantified objectives possible, both in the medium and long term. There is a divergence with our American partners on this subject…"
Marthinus van Schalkwyk, Environment Minister, South Africa: "Discussions are continuing but there are no major breakthroughs…"
Toward the end of the 2nd day, French President Nicolas Sarkozy talked to the meeting about how the 5-year-old Darfur nightmare is an example of climate change-induced suffering: "In Darfur, we see…the impact of climate change, which prompts emigration by increasingly impoverished people, which then has consequences in war…If we keep going down this path, climate change will encourage the immigration of people with nothing towards areas where the population do have something, and the Darfur crisis will be only one crisis among dozens of others." It is estimated that 300,000 people have died in the Darfur region in the last 5 years. President Bush’s term ends January 20, 2009. A preliminary meeting of Major Economies Meetings (MEMs) failed to reach meaningful agreement on global climate change action. 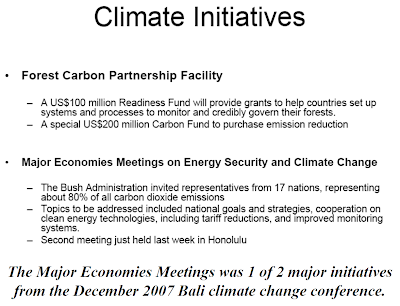 - MEMs was created by U.S. President Bush following the December 2007 Bali climate change summit, ostensibly to smooth the way for a 2009 climate change agreement on Phase 3 of the UN-led climate change fight scheduled to begin in 2013. - This unsuccessful preliminary meeting was April 17-18. - Two more preliminary meetings in May and June will precede the G8 Summit July 7-9 at which a “shared common vision” statement will be made. 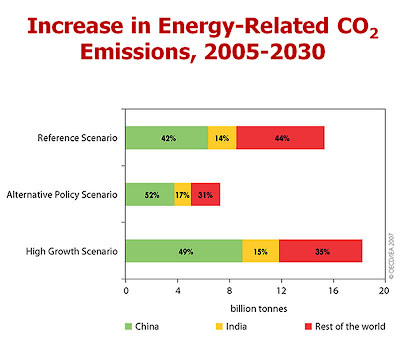 - The 16 major economies account for approximately 80% of world GhGs. - The G8 Summit will be in Toyako, Japan. - It was hoped MEMs would lead to concrete goals. It produced only disagreement over a specific timetable and emissions caps. - MEMs also will try to develop strategies for New Energy technology and energy efficiency development and innovation. - Reports were made on the financial commitments necessary for the climate change fight. - South Africa reported $30 billion to $60 billion/year will be needed to assist poor countries deal with changes and $200 billion/year to cut emissions. 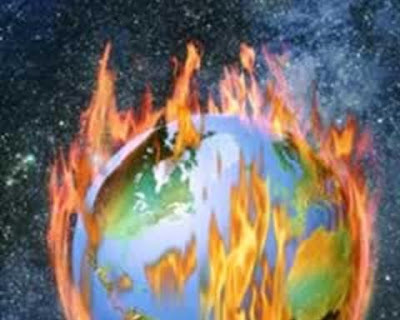 - Mexico suggested creating a $10 billion/year "Multinational Climate Change Fund" to prepare for the inevitable. Jean-Pierre Jouyet, secretary of state for European affairs, France: "We achieved a consensus on the need for long-term and medium-term goals for reducing greenhouse-house gases... but we have not quantified targets at this stage and we regret this…"
This is what a solar panel installation is, in 4 minutes. It rocks. From GreenEnergyTV. Highlights of a recent National Press Club event describing the American wind energy industry’s current contribution, its recent growth and the potential it holds for the U.S. – if the Congress extends the New Energy incentives (including the production tax credit). From the American Wind Energy Association via YouTube. The European Union’s Emissions Trading Scheme (ETS) - An extended (10 minute) and engaging look at how it works, what it seeks to accomplish and how it is doing. From EUXTV via YouTube. What a great story this is: Which brother-in-law is Cain and which is Abel? Or, from a different point of view, which is Abbott and which is Costello? Charlie Porter and County Commissioner Gary Carlson, his brother-in-law, came to blows in February. Charlie says Carlson’s Blue Ridge wind farm is making him sick, driving him crazy and making his house valueless. Carlson says Charlie is mad because there are no turbines on his property so he’s not earning income from the installation. There is something some doctors anecdotally call “wind turbine syndrome.” It is a set of symptoms that include headaches, anxiety attacks and high blood pressure as well as an inconsistent cluster of other symptoms like sleep interruptions, dizziness, nausea, exhaustion, anger and irritability, or, in short, a lot of the same things that come from a bad reaction to over-the-counter medications. It seems to be associated with living too close to the constant low frequency sound of the turbine blades turning. Wind tower strobe lights are also part of the lawsuit Porter has filed against the wind farm, claiming harm to himself, his wife and his 11-year-old daughter. On the other hand, studies of the huge Horse Hollow wind farm in Texas found the sound (44 dBA) to be the same as the noise level inside the average residence (40 to 45 dBA), according to the American Wind Energy Association (AWEA). 12 of the 27 turbines are on Carlson’s property but none are on Charlie’s. Each turbine earns the landowner $3,000/year. Actually, the developer moved a turbine away from Charlie, at a $50,000 expense. Why it was moved and why it was not moved farther will no doubt come out in the lawsuit. 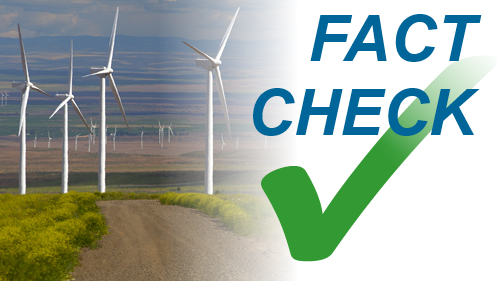 If wind installations are properly sited, they create no problems. If they are improperly sited, they give the entire industry a bad name. The wind industry goes to extraordinary lengths to see that installations are properly sited. There have been court cases determining noise not to be a problem with properly sited turbines and there is a web page of testimony to the non-problem that turbine noise has been for many at the Alliance for Clean Energy New York. Academic studies have suggested specific distances residences need to be from turbines. 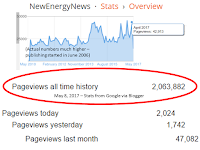 NewEnergyNews happens to know Real de Azua and that comment sounds like her restrained way of implying there is more to this story. How Charlie Porter got caught in the middle of a wind farm will hopefully come out in the legal proceedings. If the wind developers are at fault, they need to take responsibility. It could be that Charlie got himself into this. He seems to be that kind of guy. 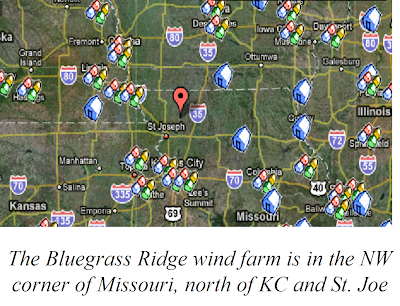 Is Bluegrass Ridge wind farm making Charlie Porter sick? Bluegrass Ridge wind farm was dedicated in September 2007. - Bluegrass Ridge wind farm is near King City, Gentry County, northwest Missouri. - Charlie Porter’s house is less than 2,000 feet from turbines. He has had his property up for sale for a year without a buyer. 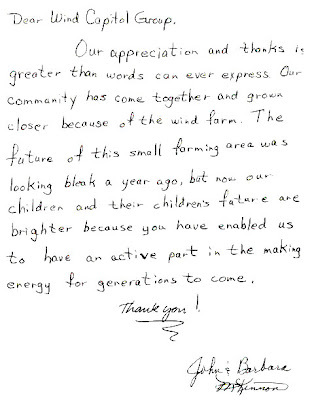 - Bluegrass Ridge wind farm has 27 turbines, none on Charlie Porter’s property. - Doctors in Canada, England, France, Australia and New Zealand, have written papers about “wind turbine syndrome.” It has been documented in sensitive people living 1,000 ft. to 1.5mi from turbines. - Sounds occurring at or below the frequency band 500 Hz seem to cause “vibro-acoustic” disease in sensitive people.